Ava is loving her new collar from Jovan Jane! Jovan Jane is a company that sells all different kinds of accessories including barrettes, headbands, hats, pet collars, etc. Their motto is "life is too short to dress boring". I agree with this idea! It was very hard to choose which item to review because there are so many great choices. I almost went with a headband but decided on the pretty collar seen above for my princess. 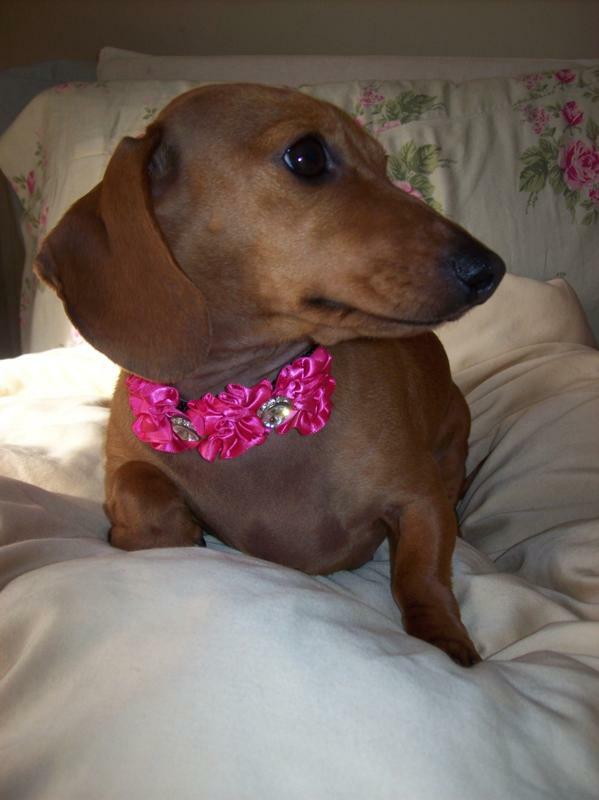 I chose this collar for her because it was very feminine and pretty. I think that Ava feels like a diva in it. It is a black collar with hot pink satin flowers and rinestones. It retails for $30 and comes in different sizes. I think that it is pretty for summer. It fits well and is good for going outside in. I would definitely recommend checking out this company if you are interested in very pretty and fun accessories! The giveaway will be for any item of your choice under $50 from Jovan Jane. The giveaway is open until Midnight on Tuesday May 10th. Winner will be chosen on Wednesday May 11th using Random.org. The winner will have 48 hours to respond or a new winner will be chosen. Please visit the Jovan Jane website and let me know which item that you would choose. Cute dog! My Mom's looked just like yours! i love the jjc19 collar! so many nice things~ My daughter is going to a party and has a gorgeous yellow dress. I saw the gorgeous Ivory band w/ a sequinced/beaded sunflower & Swarovski crystals (CITRINE & LIGHT COLORADO TOPAZ and knew that would be what I would choose as it would go with her dress. Stopping by from the Pet Bloggers Blog Hop Thanks for participating. I love the JJBR-8 Bracelet! STUNNING!!! 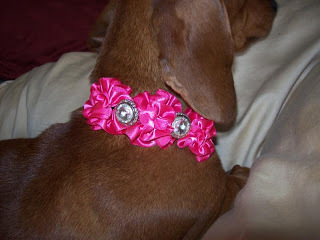 I like the Light pink collar w/ black and light pink satin flowers & Swarovski crystals pet collar. I like the butterfly headband, jjb-35. I WOULD LIKE TO TRY THE CAMEL STRAW FEDORA . I ENTER THE FOOD SHOULD TASTE GOOD GIVEAWAY. I entered the Teamotions giveaway. I would choose the JJC-16 Dog Collar-perfect for a spoiled pup! Also entered the Miloud Chenille Throw giveaway. I am sorry but I have to delete your entry on the Meet Me on Monday linky because you did not participate and post your questions and answers in your post! I would love to have you join so please come back once you have your Meet Me On Monday post completed! Hi There! Following you from Single Parent Retreat Blog Hop! I would choose Black collar w/ sports symbols, bone & metal studs. I entered Giella Nail Polish Giveaway. I entered Minky Couture Blanket giveaway. I entered Miloud Home Accents Chenille Blanket. I entered Food Should Taste Good. cannot choose !!! Too cute ! I entered the Coloriffics shoe giveaway. I entered Rudi's Organic Bakery. I entered the Coloriffics giveaway. I like the JJB-110 headband. I love the JJC-13 pet collar. I like JJBT1-The Pink Beret. Very cute items. I love the black sunhat! You blog button is on my GIVEAWAY blog! I entered the Minky giveaway! I entered the Food Should Taste Good Chips Giveaway. I entered the Contigo Travel Mug or Water Bottle Giveaway. I entered the Miloud Home Accents Chenille Blanket Giveaway. I entered the Minky Couture Blanket. I would choose the CAMEL STRAW FEDORA WITH: ORANGE, NAVY & SILVER BRAID.